Finally , The famous Online Supermarket Honestbee has launch in Malaysia today on 28/03/2017 at The Bee Publika . Honestbee is well known in asia as Online Supermarket that available in Singapore , Hong kong , Taiwan , Japan , Philippines , indonesia , Thailand and now in Malaysia . honestbee is Asia's leading online concierge and Fast reliable delivery service . For making life easier and time-consuming daily chores . Most of the time , technology is exists to bring convenience to people . Today , We Been invited By Toscana Medi Clinic to understand more about Aesthetic Treatment especially Metabolight diet and this was my First time knowing about Metabolight . Anyone Of you what is Metabolight ? - Let me Tell you about Metabolight that I known and spoke by the doctors here during the Talks . The Speech started by Dr. Lashela Dharmadass , Metabolism related in doing changes or transformation . In terms of body functions naturally and absorb nutrition foods , metabolism is about calories burned by the Treatment and eat healthy to maintain the functions of the body at anytime or anywhere even though you are busy . Foods diet plays the big role during this slimming plans too . 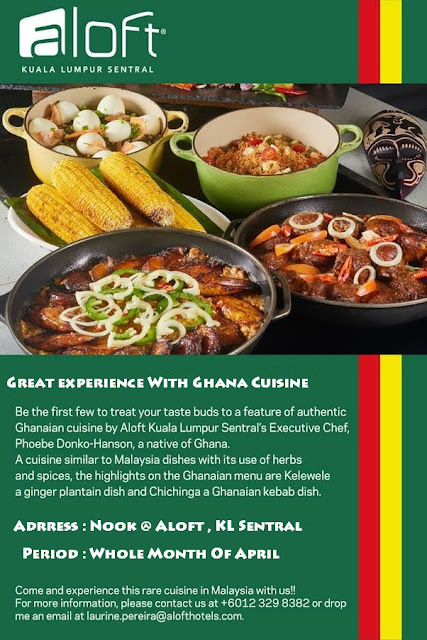 This coming April , Aloft KL Sentral brings the flavours and aromas of the Ghanaian cuisine to Malaysia with a special feature , Taste of Ghana , on the buffet spread at Nook , the hotel's all day dining restaurant . Presented by Aloft's Executive Chef , Phoebe Donko Hanson , a Ghanaian national , diners can be certain to experience authentic flavours reminiscent of her culture through signature dishes from her homeland which includes a selection of her favourite dishes and dishes that best represent the country's cuisine available at the buffet on a rotational basis .